It’s a daily dose of summer camping fun! Campers will enjoy group games, crafts, silly & fun songs, Bible lessons, swimming, exploring nature, creek-play, hiking the camp trails, GaGa Ball, 9-Square & 4-Square, parachute games, and delicious lunches including a campfire cookout. Daily check-in is from 8:30-9:00am and check-out is from 4:30-5:00pm (Friday 6:30pm). 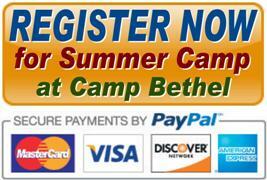 Knee-High Day Camps are very popular, so register early to secure your spot. Great counselors and activities, excellent-individual care, and a great camp! ​Subsidized Fee (discounted cost) = $200; Supporters Fee (actual cost) = $250; Sustainers Fee (cost + $50 gift) = $300.